The other day I was cleaning up my desktop and I erased an important folder containing stuff I needed. Luckily, Win7 has the ability to restore previous versions of the folder. I also tried using the “System Restore” option, but it wasn’t able to restore the deleted folder. So what I’m about to describe is a working method of restoring deleted files and folders using Windows “Restore previous versions” simple procedure. Open Computer by clicking the Start button, and then clicking Computer. 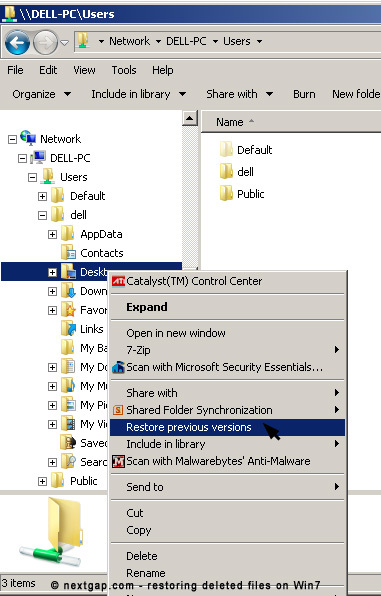 In the window that will open, navigate to the folder that used to contain the file or folder, right-click it, and then click Restore previous versions. If the folder was at the top level of a drive, for example C:\, right-click the drive, and then click Restore previous versions.You’ll see a list of available previous versions of the file or folder. The list will include files saved on a backup (if you are using Windows Backup to back up your files) as well as restore points, if both types are available.